Born the son of a poor Parsi priest near Bombay, Naoroji's long career made him a 'grand old man' of India. He was educated near Bombay at Elphinstone College where he eventually became the first Indian professor and an active participant in reform societies. In 1855, he came to London to open a branch of the firm of Cama & Co. of which he was a partner and combined commerce, politics and teaching. Commuting in the following decades between India and Britain, he campaigned to open the Indian Civil Service to Indians and on what he saw was the 'drain' of Indian financial resources caused by British rule. 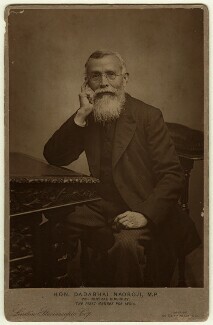 He was one of the founders of the Indian National Congress in 1885. He stood unsuccessfully as Liberal MP for Holborn in 1886 but was elected to the House of Commons for the seat of Central Finsbury in 1892 with a majority of just five votes. He lost his seat in the Conservative landslide of 1895 but, during the years he served as MP, devoted himself to Indian affairs. He died in Bombay on 30 June 1917.